The fifth EFA goal aimed to achieve gender parity and equality, yet the main measurement of progress between 2000 and 2015 was gender parity in education participation and attainment, simply comparing the number of boys to girls at different levels of education. As a result of decades of advocacy, policy work and investment, there was substantial progress in getting girls into school and improving gender parity in primary and secondary education. This section discusses trends and progress in gender parity in education throughout life, from early childhood development to adult literacy and numeracy skills, and in ensuring that all girls and boys, from all walks of life, can gain access to and complete as many education levels as they wish and achieve high levels of learning. Access to early childhood development programmes, especially for children from disadvantaged backgrounds, can reduce inequality by ensuring that all children begin formal schooling with equal foundations. Good health and nutrition, early and continuous cognitive stimulation, and supportive home environments are key constituents of early learning that pay lifelong dividends (UNESCO, 2015a). The 2030 Agenda reaffirms that all children deserve the strong foundation provided by early childhood care and education of good quality. In 2014, the global pre-primary gross enrolment ratio was 44%. Southern Asia is the region with the lowest participation rate (18%), followed by sub-Saharan Africa (22%) and Northern Africa and Western Asia (29%). Much higher rates are observed in Latin America and the Caribbean (73%), Eastern and South-eastern Asia (76%) and Europe and Northern America (85%). Gender parity in preprimary education has been nearly achieved everywhere except Southern Asia, where 94 girls are enrolled in preprimary education for every 100 boys. About 63% of all countries with data record gender parity in pre-primary enrolment. In the remaining 37% of countries, more girls are enrolled in 37 countries and more boys in 22. The percentage of countries that achieved parity in pre-primary education is still below 50% in Caucasus and Central Asia, Northern Africa and Western Asia and sub-Saharan Africa. Djibouti, Morocco, Pakistan and Yemen have the highest disparity at the expense of girls, with fewer than 90 girls enrolled for every 100 boys.By contrast, in Armenia, Mauritania and Saudi Arabia, fewer than 80 boys are enrolled in pre-primary education for every 100 girls. Genuine progress was achieved in gender parity in primary and secondary education, alongside rapid education expansion. In 2014, gender parity was achieved globally, on average, in primary, lower secondary and upper secondary education. But the global averages mask continuing disparity in many regions and countries (Table 1). At the primary education level, where gender disparity persists in 37% of countries, disparity is at the expense of girls in more than 80% of them. Such gaps are concentrated in Northern Africa and Western Asia, where just 95 girls are enrolled in primary school for every 100 boys, and sub-Saharan Africa, where 93 girls for every 100 boys are enrolled. These regions have, however, made significant progress since 2000, with the gender parity index increasing from 0.88 and 0.85, respectively. Southern Asia is the only region with more girls than boys enrolled in primary education, though there is wide variation among countries. In Afghanistan, 70 girls per 100 boys are in school, while in India, nearly 90 boys for every 100 girls are enrolled. As of 2014, 61 million children of primary school age were not enrolled in school, compared with 100 million in 2000. Girls make up 53% of the global population of children out of school, the same share as in 2000, and 1 in 10 girls, compared with 1 in 12 boys, were out of school in 2014. The largest gender gaps are in Northern Africa and Western Asia and sub-Saharan Africa. Analysis shows that, globally, 47% of the 32 million girls who were out of school in 2014 are expected to never go to school, compared with 35% of the 29 million boys. More boys than girls – 47%, compared with 32% – are likely to enrol late (Figure 1). Girls face the biggest barriers in sub-Saharan Africa. Of out-of-school girls, 50%, or 9 million, will never enter a classroom, compared with 41% of out-of-school boys (6 million). Compared with 33% of girls, 42% of boys are expected to enter school. Similar trends are found in Southern Asia, where the gender gap is even wider. Of the region’s out-of-school girls, 81% are unlikely to start school, compared with 42% of out-of-school boys, most of whom are likely to enrol late (UIS and UNESCO, 2016). Data for six countries in which over one-third of the world’s out-of-school population live confirm regional patterns: poor children, especially girls, are at particular risk of being excluded from school. In the countries with high percentages of children out of school, the poorest girls continue to be most likely never to have attended. In Nigeria, where 8.7 million children of primary school age were out of school in 2010, the poorest girls’ access to education has worsened since 2000; the percentage of the poorest females who had never attended school increased from 46% in 1999 to 76% in 2013. 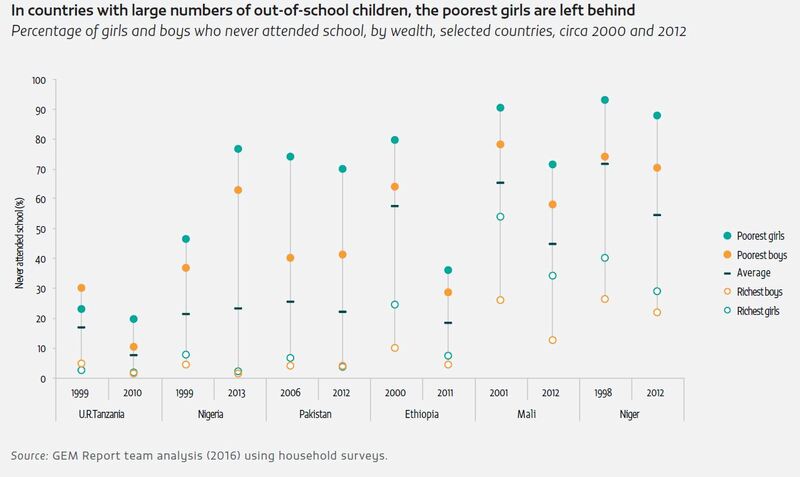 Even in countries such as Ethiopia that have made good progress since 2000, wide disparity remains and the poorest girls are still more likely never to have attended school (Figure 2). 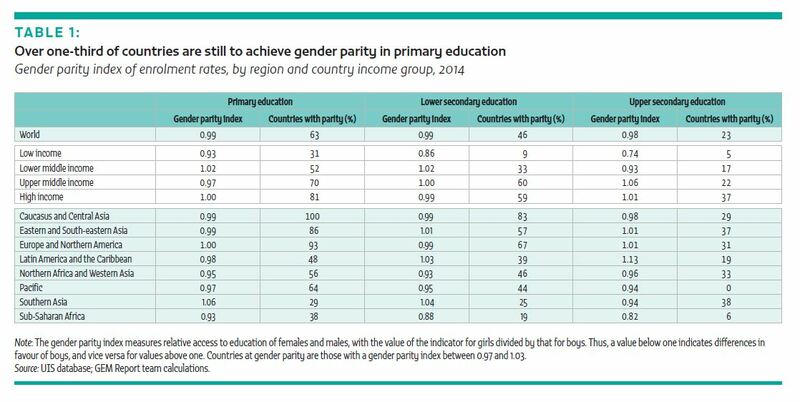 Gender disparity is found in more countries in secondary education than in primary. In 2014, 54% of countries had not achieved gender parity in lower secondary education and 77% in upper secondary (Table 1). Patterns of gender disparity are more complex at the secondary level. While at primary level, girls remain much more likely to be disadvantaged in many countries, at secondary level gender disparity can favour girls. Gender disparity is at the expense of girls in lower secondary education in nearly 60% of countries and in upper secondary in 43%. Gender disparity at girls’ expense is more common in countries with low secondary enrolment ratios. Of the 10 countries with fewer than 80 girls enrolled in lower secondary education for every 100 boys, 7 are in sub-Saharan Africa. In two countries recently affected by conflict, the Central African Republic and Chad, less than half as many girls as boys were enrolled in lower secondary school in 2014. Lower secondary enrolment rates where boys are disadvantaged are more common in countries with high overall enrolment. Suriname has achieved a lower secondary enrolment ratio of 97% but has 86 boys enrolled for 100 girls. In most countries with fewer boys than girls in lower secondary education, the disparity is due to higher dropout rates for boys rather than higher transition rates of girls from primary to lower secondary school. The situation is similar in upper secondary education. Out of the 23 countries with fewer than 80 girls in upper secondary education for every 100 boys, 16 are in sub-Saharan Africa. Gender disparity favouring girls occurs in 25 of the 31 countries in Latin America and the Caribbean with available data. In Brazil and Uruguay, fewer than 83 boys for every 100 girls are enrolled in upper secondary education. The 2030 Agenda prioritizes universal completion of primary and secondary education, but this seems out of reach in much of the world. Household survey data analysis shows a primary completion rate of 51% in low income countries, 84% in lower middle income countries and 92% in upper middle income countries. Only one in four adolescents in low income countries complete lower secondary education; four in five did so in upper middle income countries. Even in high income countries, only 84% of young people complete upper secondary education. The challenge is greatest, however, in low income countries, where only around 15% complete upper secondary (Table 2). Gender parity trends in completion vary by region, income group and level. Gender parity in primary school completion was achieved only in Eastern and Southeastern Asia and Southern Asia. Fewer girls than boys complete primary school in Northern Africa and Western Asia and sub-Saharan Africa. Yet, in Latin America and the Caribbean, 95 boys per 100 girls complete primary school. In Southern Asia and sub-Saharan Africa, gender disparity is wider at the upper secondary level and more boys than girls complete secondary education. In Latin America and the Caribbean, boys are less likely than girls to complete lower and upper secondary school. In countries including Honduras and Suriname, fewer than 70 boys complete both levels of secondary school for every 100 girls. There is major inequality in school completion in additional respects. In sub-Saharan Africa, gender parity exists among the richest 20% who have completed primary education but among the poorest 20%, 83 females completed primary education for every 100 males, dropping to 73 for lower secondary and 40 females for upper secondary. 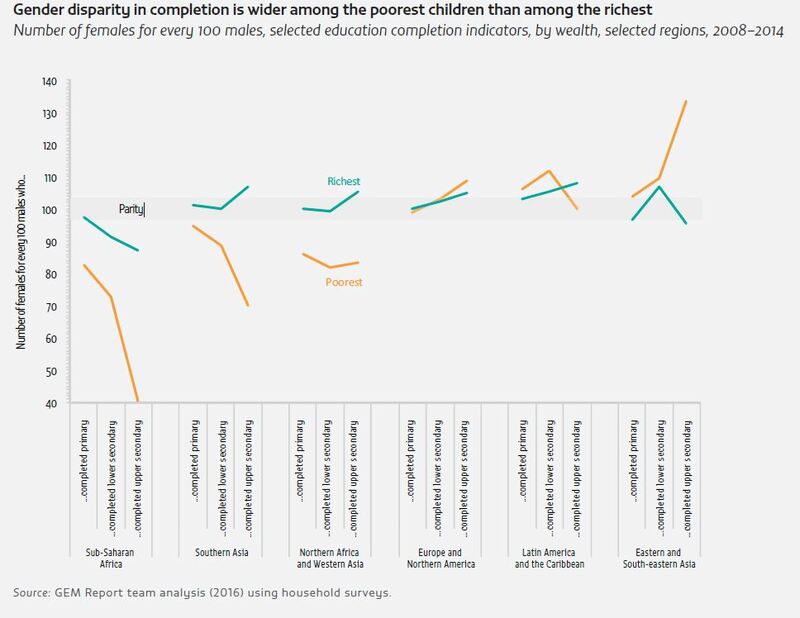 By contrast, considerable disparity exists at the expense of the poorest males in Eastern and South-eastern Asia in lower and upper secondary completion (Figure 3). In many poor countries, such as Mozambique and the United Republic of Tanzania, less than 2% of young women from the poorest families completed lower secondary school in 2010/11 while over 35% of young men from the richest families did so. Completion rates for adolescents, particularly boys, are a growing concern in many Organisation for Economic Cooperation and Development (OECD) countries. In 2013, among countries participating in the EU-SILC survey, gender gaps at boys’ expense exceeded 20% or more in Malta and Portugal. In some European countries, low socio-economic status amplifies boys’ disadvantage in upper secondary completion. 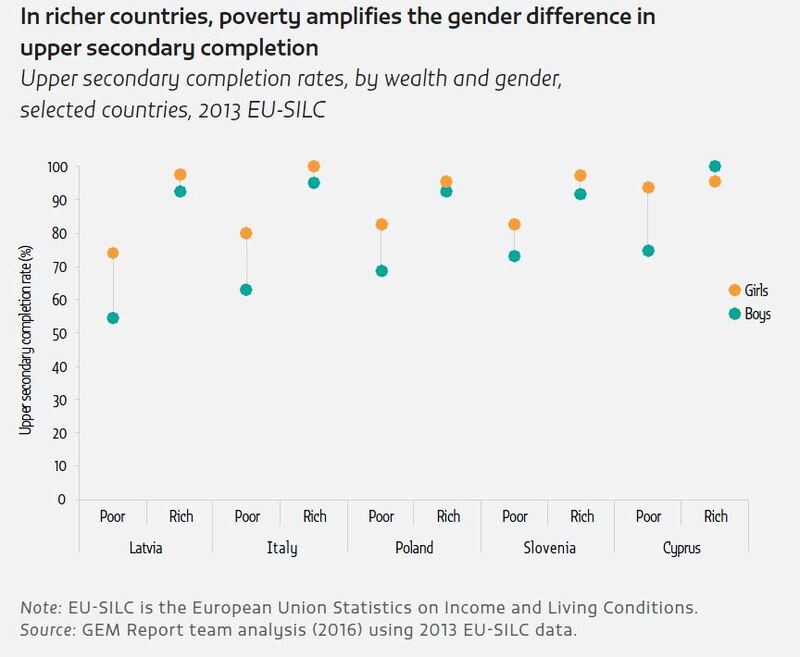 Across six European countries, gender gaps among rich children are small but among poor children they are striking: In Latvia, 75% of poor girls but only 55% of poor boys complete upper secondary education (Figure 4). In many countries, living in rural or disadvantaged areas often puts children and adolescents at greater risk of not completing school. Over 2009 –2014 in low income countries, 19% of rural children completed lower secondary education, compared with 48% of urban children. In Nigeria, Pakistan and Yemen, only about 25% of rural girls complete lower secondary education but nearly 50% of rural boys do. 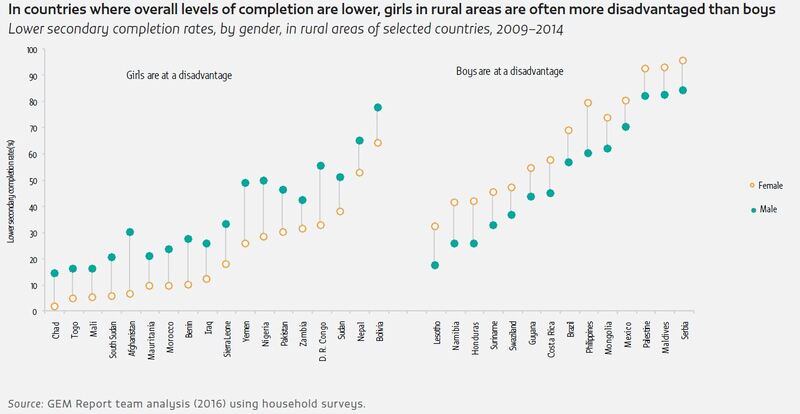 In contrast, in countries including Mexico, Mongolia and the Philippines, boys in rural area are less likely to complete lower secondary schooling –although in these countries overall levels of completion tend to be higher and gender gaps narrower (Figure 5). 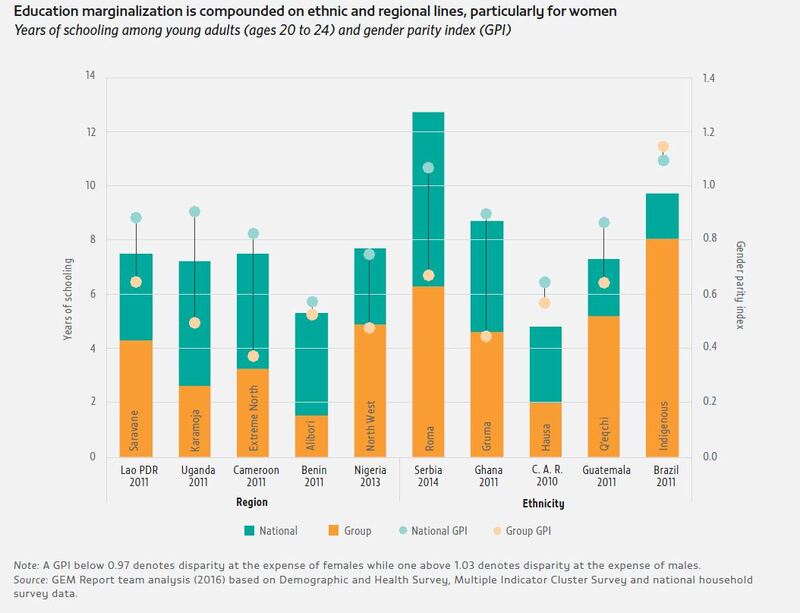 Inequalities linked to location, wealth and gender do not operate in isolation, as analysis of household surveys shows for Brazil, India, Lesotho and Nigeria. In 2013 in Nigeria, over 90% of adolescents from rich households, whether urban or rural, female or male, were likely to complete lower secondary education. Among poor rural young women, only 3% completed lower secondary school, compared with 17% of poor rural young men. In 2011 in India, upper secondary completion rates of rich urban girls and boys averaged 70%; for poor rural males, the average was 26% and the rate was much lower for poor rural females. In some countries, the interaction of location, gender and poverty is a potent source of exclusion for girls and boys. In Lesotho, 4% of poor rural males complete lower secondary education, on average, compared with around 60% of rich girls and boys. In Brazil, 9% of poor rural males complete lower secondary school, twice the rate for poor females. In only 10 of 90 low and middle income countries with data did 20- to 24-year-olds attain, on average, at least 12 years of education (Figure 6). In many countries in Southern Asia and sub-Saharan Africa, including Afghanistan, Benin, Chad, Ethiopia, Guinea, Pakistan and South Sudan, the poorest young women attained less than a year of schooling, compared to about two years or more for the poorest young men. On the other hand, males attain fewer years of education than females in many countries with a relatively high number of average years of schooling in Latin America and the Caribbean and in Europe and Northern America. The poorest boys have less schooling than the poorest girls in almost 20 of the 30 countries where average attainment is at least 9 years, while this is the case in just 3 of the 60 countries with an average of less than 9 years. Within disadvantaged regions and ethnic groups, gender disparity in years of schooling tends to be greater (Figure 7). In Cameroon, where young adults in the Extreme North region average 3.2 years of education, young women have less than half the attainment of young men, compared to the national gender parity ratio of 0.8. In Serbia, young Roma women have two-thirds the educational attainment of their male counterparts, while at the national level, young women average more education than men. On the other hand, in Brazil, indigenous young men have less attainment than their female counterparts, reflecting national patterns. In all conflict affected countries, 21.5 million children of primary school age are out of school. Over the past decade, the problem of out-of school children has been increasingly concentrated in conflict-affected countries, where the proportion increased from 29% in 2000 to 35% in 2014; in Northern Africa and Western Asia, it increased from 63% to 91% (UIS and UNESCO, 2016). Conflict reinforces gender inequality. Girls are almost two and a half times more likely to be out of school if they live in conflict-affected countries (UNESCO, 2015c). Refugee girls are less likely to finish primary education, transition into and complete secondary education. Displacement weakens children’s protective environments and families can resort to coping mechanisms that disadvantage girls, including child domestic work and child marriage. In Kakuma camps in Kenya, in 2015 only 38% of primary school students were girls (UNHCR, 2015). Girls and boys achieve different outcomes in school, in overall performance and by subject. Regional and international learning assessments at primary and secondary level show wide-ranging gender differences. Girls continue to outperform boys in reading and language arts. The Programme for International Student Assessment (PISA) 2012 survey of 34 OECD countries and 31 partner countries and economies showed 15-yearold girls achieving significantly higher scores in reading than boys in all locations. In some countries, including Bulgaria, France and Portugal, the gender gap had widened since 2000, largely due to greater improvement in girls performance (UNESCO, 2015a). Analysis of the Third Regional Comparative and Explanatory Study (TERCE) showed a strong gender disparity in Latin American countries. Girls scored higher than boys in grades 3 and 6 reading performance, with the reading advantage already evident in grade 3 becoming stronger by grade 6. The reading achievement gap was greater than 20 points in Argentina, Chile and Panama (UNESCO, 2016b). Boys have historically outperformed girls in mathematics in all grades of primary and secondary education – but that is changing. The PISA 2012 results show boys performing better than girls in mathematics in a majority of locations, although the gap has narrowed in some countries, such as Norway and Slovakia (UNESCO, 2015a). Among countries participating in TERCE, there was no gender gap in mathematics performance among third-graders; gender gaps appeared only at higher levels. In Costa Rica, Nicaragua and Peru, boys performed significantly better than girls, while in Argentina, Brazil and the Dominican Republic girls performed better. But sixth-grade mathematics scores revealed a strong pattern of gender achievement gaps. 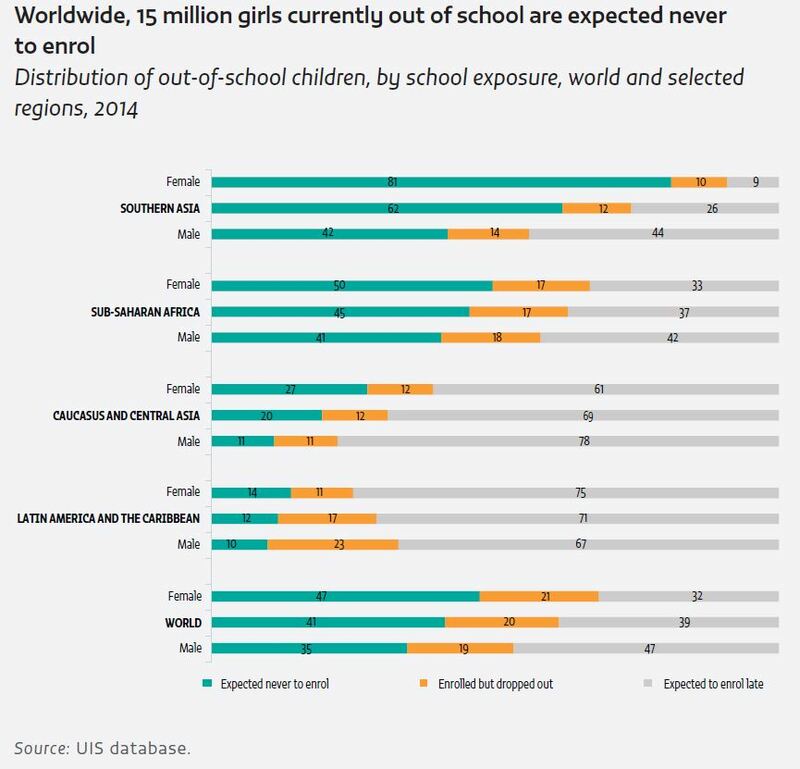 In most countries– except Chile, Panama, Paraguay and Uruguay – sixthgrade girls performed significantly lower than sixth grade boys (UNESCO, 2016b). Girls and boys can perform equally well in reading, mathematics or science under the right conditions: There is no inherent difference in their capacities. To close the gap in reading, parents, teachers and policy-makers need to entice boys to read more. To close the gap in mathematics, progress in gender equality outside the classroom, notably in employment opportunities, could play a major role in reducing disparity. New analyses for the 2016 GEM Report show that if past trends continue, not even the EFA goal of universal primary completion, also set in the Millennium Development Goals, is likely to be achieved by 2030. The target of universal secondary completion is clearly beyond reach. If past growth rates continue, 84% of 15-to 19-year-old girls and boys in 2030 will complete lower secondary education and 69% upper secondary (Table 3). At past rates, low income countries would not achieve universal primary and secondary education before the end of the century. Around half of 15- to 19-year-old girls and boys in 2030 would complete lower secondary education in low income countries, and only 33% of boys and 25% of girls would complete upper secondary. Achieving universal secondary completion requires an unprecedented and immediate break with past trends. Gender disparity is projected to remain wider at the secondary level. At the primary level, 127 countries (81%) will have achieved parity by 2030. Yet at the lower secondary level, 66% of countries with data are projected to have reached gender parity, while at the upper secondary level only 30% are projected to have done so. More women than men were enrolled globally in higher education institutions in 2014, when the average gender parity index was 1.11; in 2000, women and men were at par (Table 4). Gender disparity favouring women is more frequent than in secondary education but follows similar patterns. More women were enrolled in upper middle and high income countries, while more men were in low income countries. More women were enrolled in Europe and Northern America, Latin America and the Caribbean and the Pacific, with far fewer female students in tertiary education in Southern Asia and sub-Saharan Africa. In some countries, including Afghanistan, Benin, the Central African Republic, Chad and Niger, fewer than 40 women were enrolled for every 100 men. In most countries, disparity for men worsens between tertiary education entry and completion. In Costa Rica, 80 men enrolled but 55 graduated for every 100 women in 2014. In Caribbean countries, including Aruba, and in Northern Africa and Western Asia, including Kuwait, about three times as many women as men graduated from tertiary education. In the relatively few countries with enrolment disparity at the expense of women, disparity in graduation is smaller. In 2014 in Egypt, 90 women for every 100 men were enrolled in tertiary education, but graduation rates showed less gender disparity. Worsened disparity between enrolment and graduation is less common. In 2013 in Rwanda, 79 women enrolled but 53 graduated for every 100 men (Figure 8). Literacy opens doors to better livelihoods, improved health and expanded opportunity. It empowers people, especially women, to take active roles in their communities and build more secure futures for their families. Children with literate parents have enormous advantages in access to education and in learning achievement. By contrast, illiteracy can entrap households in poverty and diminished opportunity, and undermine national prosperity. In 2014, the global adult illiteracy rate was 15%, equivalent to 758 million adults (Table 5); 63% of adults who are illiterate are women, with almost no progress since 2000 in reducing this share. In Southern Asia and sub-Saharan Africa, around one in three adults are illiterate. In Northern Africa and Western Asia, the proportion is nearly one in five. Gender disparity in adult illiteracy rates is significant in all three regions. In Afghanistan, literacy rates for males are more than twice those for females. In Yemen, 47% of adult women and 16% of men are illiterate. In the Democratic Republic of the Congo, Mozambique and Togo, women are twice as likely as men to be illiterate. Youth illiteracy rates are lower overall than those of adults, reflecting improved access to primary and secondary education among younger generations. Globally, about 9% of youth aged 15 to 24 are unable to read or write a sentence, equivalent to 114 million people. Gender disparity among youth is less than among adults in all regions. Young people from poorer households are far less likely to possess functional literacy skills needed for everyday life. 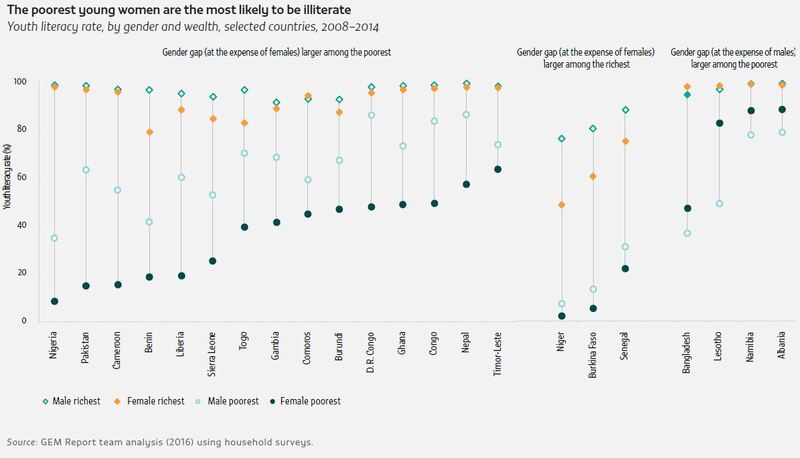 Among the poor, young women are the most likely to get left behind, while young men, along with women from richer households, are likely to achieve basic literacy skills (Figure 9). In Pakistan, only 15% of poor young women aged 15 to 24 are able to read in everyday situations, compared with 64% of poor young men. In countries in sub-Saharan Africa, including Burkina Faso, Niger and Senegal, people aged 15 to 24 acquire very low levels of literacy skills, and girls from both rich and poor households tend to be less literate. In Niger, 77% of rich young men have basic literacy skills, compared with 49% of rich young women, 7% of poor men and 2% of poor women. Disadvantage in acquiring basic skills is compounded by poverty, location and ethnicity. In Nigeria, only 4% of poor young women in the North West zone can read, compared with 99% of rich young women in the South East. In Indonesia, rich young women in Bali province have near-universal literacy skills but just 60% of poor young women in Papua province are literate. In Ethiopia, poor young Afar women are among the most disadvantaged in terms of basic literacy skills (Figure 10). Illiteracy is no longer considered a problem in countries that long ago achieved universal primary education. 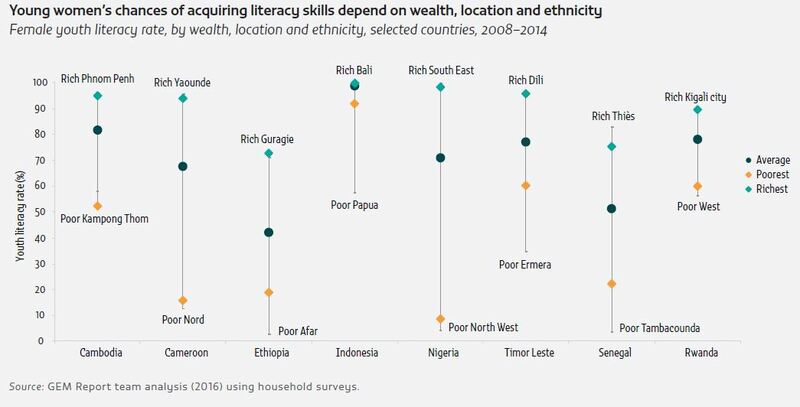 Yet low levels of adult literacy in richer countries are more prevalent than is generally known. Across the 33 upper middle and high income countries that participated in the 2012–2015 rounds of the OECD Programme for the International Assessment of Adult Competencies (PIAAC) survey, around 20% of women and men aged 16 to 65 were assessed as having low literacy skills, scoring at or below level 1 on the PIAAC proficiency scale.1 In most countries, there was no significant gender gap in literacy proficiency; even in countries with a statistically significant difference, it was relatively small. Numeracy proficiency was different. In all participating countries except the Russian Federation, adult men scored higher than women, with the largest gender gaps in Chile, Germany, Northern Ireland (United Kingdom), Spain and Turkey, a country where 59% of women possess low numeracy skills, compared with 42% of men, and fewer women than men achieve the highest levels of numeracy2 (OECD, 2016c).